Global Automotive Sunroof Market size contribution was about $4.67 billion for 2014 and is projected to record CAGR of about 9.9% during forecast timeline. Rising use of smart glass in automotive along with high convenience for end users is projected to propel demand. Further, growing automobile production is also projected to enhance industry expansion in future. Rising customer choice for the products is projected to propel industry growth during forecast timeline. Key automotive sunroof manufacturers offer inbuilt system to their mid-section vehicles. However, issues like poor calibrations, leakage, electrical failures, improper installation and growing concerns about altering structural integrity of roof of automobiles can hinder the product demand. Increasing automotive sunroof industry trends as a post-sale customization has witnessed an increase in product reputation, primarily in APAC. Rising disposable incomes of consumers has resulted in enhanced purchasing capacity and rise in purchase of luxury vehicles is projected to favorably affect the product demand. Automotive sunroof market share is projected to be bolstered by technological growth in area of solar roofs for electric automobiles. Global automotive sunroof industry is segmented into fabric product and glass product. Fabric product segmented is sub-segmented into removable and foldable. Glass product segment is sub-segmented into panoramic, pop-up, top mount, inbuilt and spoiler or tilt & slide. Glass sunroof product segment was the dominating segment for 2014 and is projected to lead the industry during forecast timeline. Inbuilt glass product sub-segment contributed more than 40% of total industry share for 2014 and is projected to record CAGR of 7.6% during forecast timeline. Enhanced factory deployed products along with increasing industry demand are forecast to propel the sub-segment growth. Panoramic sunroof product segment is projected to experience significant expansion and record CAGR of more than 15.1% during forecast timeline due to consumer choice for automobiles equipped with big sunroofs. Fabric sunroof segment in Europe and North America features high demand for foldable prototypes. This is predicted to propel its growth in future. Global automotive sunroof market is segmented into key geographical locations like North America, MEA, LATAM, Europe and Asia Pacific. Europe sunroof market was evaluated at $1.7 billion for 2014 and is projected to dominate the global industry during forecast timeline due to substantial penetration of luxury cars in the region. UK and Germany are key contributors to regional industry expansion. 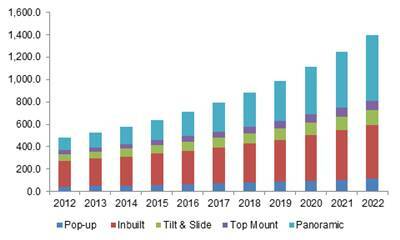 Asia Pacific glass sunroof industry is projected to record CAGR of more than 11.1% in future. This can be mainly credited to changing customer choices and rising product demand in country in China. Key industry participants profiled in the report include NSG Pilkington, Inteva, Automotive Sunroof Company, Webasto, Yachiyo Industry Company Limited, Johnan America Incorporation, Valmet Automotive, Mitsuba Corporation and Inalfa. This entry was posted in Automotive & Transportation and tagged Application Potential, Automotive Sunroof Market Size By Product, Competitive Market Share & Forecast, Industry Analysis Report, Price Trends, Regional Outlook. Global market Insights has announced addition of a new study based report on automotive air filters market. The report estimates this market to be worth USD 7.2 billion by 2022, at a growing CAGR of 8.1% from 2015 to 2022 owing to escalating demand for two wheelers and passenger particularly in BRICS countries because of growing disposable income and rising industrialization rate. The automotive air filters industry is largely determined by the trends in the automotive industry globally. Furthermore, increasing awareness regarding health disorders related to contaminated air and growing air pollution is also projected to positively impact the market growth. Growing air pollution is a key factor to drive the industry growth. The report covers comprehensive market overview including definition, application and segmentation on the basis of region, product, end-use, application and competitive landscape. The report includes in-depth analysis of the market with focus on key factors that influence the market like drivers, impediments, opportunities and challenges. Growth of electric vehicle industry owing to its features like less maintenance, negligible gas emissions, and environment friendly is expected to influence automotive air filter demand. Advent of electric vehicles is likely to hamper automotive air filters industry growth. Cabin filters are projected to continue its dominance in the global automotive air filters product segment and witness substantial growth during the projected period. Intake filters are likely to upsurge at a projecyed CAGR of over 7% in the near future owing to rising consumer awareness about the long lasting automotive engines. Passenger cars dominated the application segment and is expected to observe growth during the projected time frame owing to growth in tourist and personal vehicles. Light & heavy commercial vehicles are forecast to grow steadily. Aftermarket is likely to dominate the end use segment with maximum gains over the anticipated period. The growth attributed to rising need of air filters replacements. Asia Pacific is projected to be the dominant region owing growth in automobile production growth in the region. U.S. market size is likely to register substantial growth over 8% by 2022. Highly fragmented global automotive air filters market has witnessed frequent mergers and acquisitions. The report features competitive analysis of the key players with profiles, business strategies, current trends, and financial metrics listed in the report. The key players covered in the report include Denso Corporation, Cummins Inc., Lydall Inc., Ahlstrom Corporation, Parker Hannifin Corp., K&N Engineering Inc., Toyota Boshoku Corporation and Roki Co. Ltd. This entry was posted in Automotive & Transportation and tagged Air Filters Market, Automotive Air Filters, Automotive Air Filters Market Size, Passenger automotive air filters market, U.S. automotive air filters market size. The automotive HVAC industry will subsequently benefit from the increased demand for luxury cars and improved comfort features in low-priced cars as well as commercial vehicles. 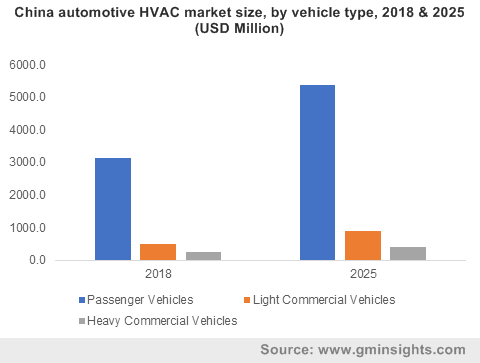 Introduction of automated systems in cars to control temperature and cooling functions will greatly transform the automotive HVAC market dynamics. This entry was posted in Automotive & Transportation.